Elegant Blue Stripe design with side mirror pockets. Material - 2 x 2 Blue Grey Matty with Water-Resistant Coating. Autofurnish Ace Printed Stripe Car Body Cover is a new stylish and elegant printed stripes design which gives a whole new look to your car. Cover includes side mirror pockets which are made precisely to the size of the mirror. 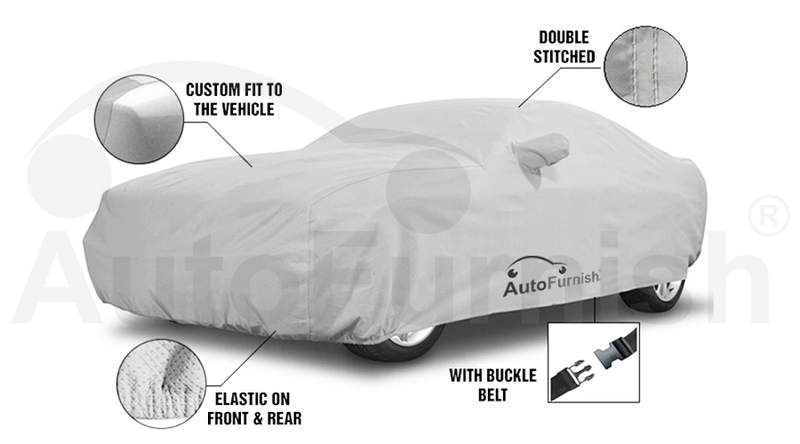 This car cover is made of 2 x 2 Blue Grey Matty with a special Water-Resistant Coating protects your vehicle against wet, humid and dusty climatic conditions. This cover allows maximum air circulation under the cover, assures that any moisture or condensation under the cover can easily evaporate, and reduces heat on hot days.